To submit news items, please email alumni@weston.org. Click here for Class of 1969 reunion info. Lynne M. Lee, passed away April 11, 2019. NORTH FALMOUTH - Lynne Michelle Lee, 68, of North Falmouth, Massachusetts, passed away on April 11, 2019 after a courageous battle with cancer, at home surrounded by her loving family. Born October 13, 1950 in Newton, MA, Lynne was the fifth of six children born to Doris and William Lee. A graduate of Weston High School, she earned a BA from U Mass Dartmouth. Mother of Christopher Chace Pearson and his partner Daphne Dentz, and William Harrell Lee, loving grandmother of Oliver Chace Pearson, sister to William, David, Diana, Theodore and Richard and a favorite aunt to 16 nieces and nephews. Lynne is remembered as a kind, loving mother, wife, sister, and aunt. Having a passion for helping animals in need, she adopted many who found their way to her door. She worked in the Falmouth Schools as a teacher’s assistant, a position that brought her great joy, until she retired in 2018. Few, if any, are left in the school system who remember Peter H. Richardson, whose obituary appeared in the Boston Globe a day or two ago. Among the facts missing in the article is that he was elected to the Weston School Committee, after serving on several education-related groups in Weston. One of those groups was a study committee that led to the development of plans for what in the late 1960's became the new Weston Junior High School, later renamed Weston Middle School. He was instrumental in getting the new school passed by Town Meeting and in supporting the concepts and policies that became the House system that exists to this day. For those of us who were involved in teaching the sciences, Peter was especially helpful in promoting the building of the laboratory science rooms. As a School Committee member, Peter had a distinguished role in maintaining balance between the educational priorities of the school system and the financial concerns of the Town. Among other tasks, he happily accepted the role of fair negotiator in a number of collective bargaining agreements and proudly advocated for some of the more progressive contract provisions, many of which, I assume, remain in place or were slightly amended. He also continued his strong advocacy for the sciences through his work on budgets and personnel recruitment. In my humble opinion, it would be a too bad to not acknowledge Peter H. Richardson's service to the Weston Public Schools and the Town of Weston. I am sure that the Town Report includes his dates of service, just as his obituary contains details about his family, career, and life after Weston. The weekend of March 22-23, 2014. Visiting hours at the Giragosian Funeral Home, 576 Mt. Auburn Street, Watertown, Thursday, March 27, 2014, 5-8pm. Funeral services at Holy Trinity Armenian Church, 145 Brattle Street, Cambridge, Friday, March 28, 2014, 11am. 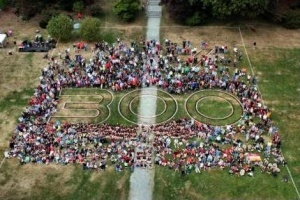 On 10/15/13, people stood in formation on the Town Green to commemorate the tricentennial.